Chabichou du Poitou cheese was awarded an AOC (appellation of controlled origin) in France in 1990 and has been registered as an AOP (appellation of protected origin) on a European level since 1996. 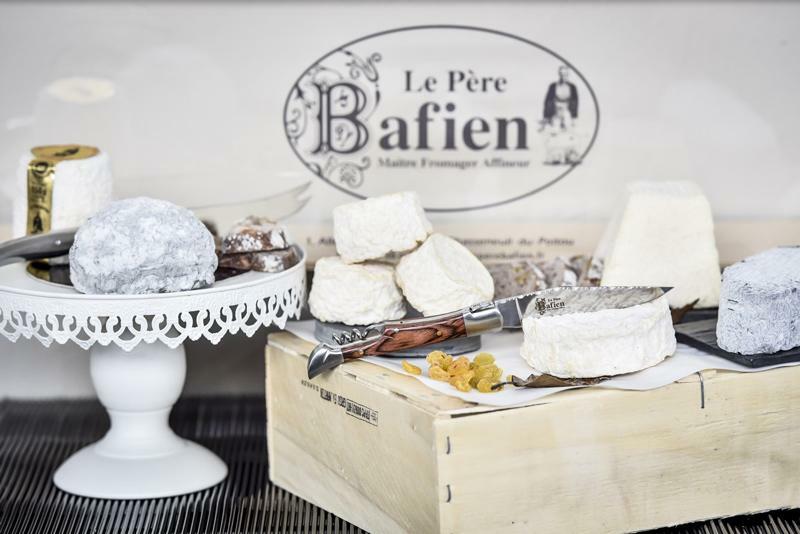 This cheese, typical of Deux-Sèvres, Vienne and some villages north of Charente (the area is delimited by limestone Haut-Poitou), is made from raw, whole goat’s milk. It is moulded in ladles and has an easily recognisable small ‘plug’ shape. It is a soft, unpressed, uncooked cheese which is matured for at least ten days after the process of renneting (separating milk into solid curds). Its thin crust has superficial white, yellow or blue spot and the cheese has a firm body and an even, fine texture. It has a mild but lingering goat’s cheese flavour with a hint of bitterness and saltiness, and at times, with dried fruit notes. Chabichou du Poitou’s flavour ranges from mild to more robust. Every cheese is a discovery, whether fresh, semi-dry, dry or very dry. With its subtle taste and its smooth, soft and melting texture when young or only slightly mature, it crumbles in the mouth, joined by more robust flavours following a long period of maturation. Across the aroma wheel, it even goes so far as some dried fruit notes. That’s the magic of maturation! Numerous very strict checks have to be completed before this little cheese can be elevated to the official rank of Chabichou du Poitou AOP. These quality checks relate to the composition (fat content, dry extract etc. ), bacteriological quality, and of course, organoleptic quality of Chabichou du Poitou. And in order to get even closer to perfection, the cheese’s external appearance, body, cross-section and flavour are also impartially graded by the ENILIA-ENSMIC sensory analysis laboratory in Surgères. Checks are overseen by a committee of manufacturing professionals, experts and consumer representatives. The number of checks performed is determined by the number of cheeses sold over a twelve-month period: three annual checks for producers making fewer than 20,000 units a year, six for those selling more than 20,000 units.